Join us for our Second Annual Brew-Ja Beer Crawl! From the makers of Pilsen Cantina Crawl, now fundraising for Pilsen Fest 2018, we bring you a new addition of local beer drinking, trolley riding around the hood, music, food, and other shenanigans. Sip delicious local brews at several unique bars and restaurants in Pilsen! Wear your horrifying and fashionable Halloween and Day of the Dead costumes. There will be a prize for the best costume. Zombies, Catrinas and White Walkers are welcome! One delectable crafted beer pour from each of the participating bars. 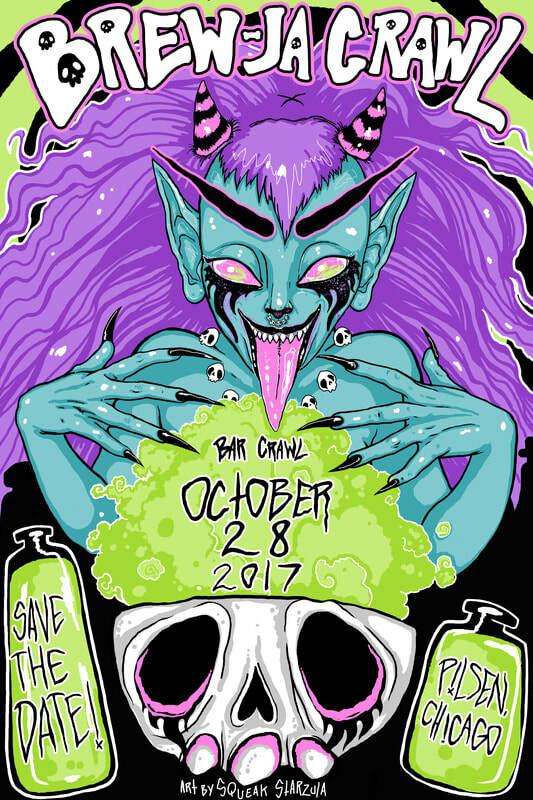 Pilsen Fest is proud to present the original artwork for the Brew-Ja Crawl poster by Squeak Starzula. She is a free lance artist from the Southside of Chicago. Her work is based off of elaborate visions summoned from the depths of a realm inside of herself, bringing forth high saturation colors balanced with contrast and texture in a variety of mediums including but not limited to paintings, sculpture and wearable art to share with this dimension.